L.W. de Vis-Norton : A Sport of Princes, 1916. A.H. Ford, Honolulu, Volume 12, Number 2, August 1916. This. Contains an article on Hawaiian surfriding, "The Sport of Princes" by L. W. de Vis-Norton, pages 146 to 152.
canoe coasting on the waves reign king and queen of sports. and years in Hawaii instead of the weeks they had intended. 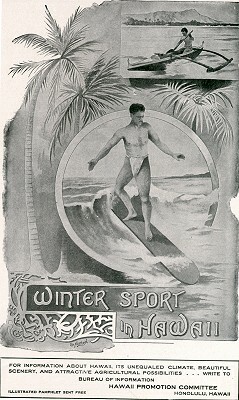 Noetzel, Gr :Winter Sport in Hawaii, 1908. By L. W. DE VIS-NORTON. Every visitor to the Hawaiian Islands, those gems of tropical beauty which lie in mid-Paciﬁc, has seen them; everyone who has read in printed books of the ideal conditions under which life is lived in these same islands has received mental impressions of them; everyone who has glanced through a dozen pictures or photographs of these lands has come across at least one portrayal of them. and every lover of clean, healthful, life-giving sport has heard of them. The surf-riders of Hawaii—~from one end of the world to the other their fame has gone abroad. 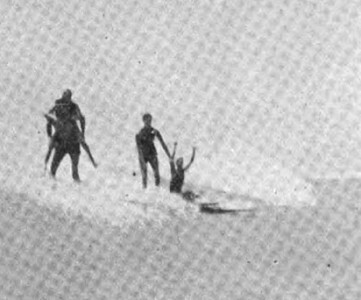 It is probable that in every civilized land possessing a seacoast and curling breakers some attempt has been made to imitate them, but it is certain that in no other place in all the world has the art of surf-riding been brought to such perfection of skill, or carried out with such ease and grace as here in the Hawaiian Islands, so richly favored of God and of man. by day in almost every place of entertainment throughout the great continent, it should be remembered that the locality celebrated by the song, the famous beach at Waikiki, is the present center and home of the surf-riders of Hawaii. Many are the imitators of the native riders; many a dweller in the Eden city of Honolulu has spent months and months in trying to acquire the poise and skill of his browner brother. To some degree of conquest they may perchance attain, but I would venture to state that never will the white man outdo the true Hawaiian in this most exhilarating of all outdoor pastimes. It must not be thought, however, that the sport of surf-riding is a modern invention. common pastime among the people and that from the humblest subject right up to the greatest and most powerful chief and king, the whole population was wont to indulge almost daily. 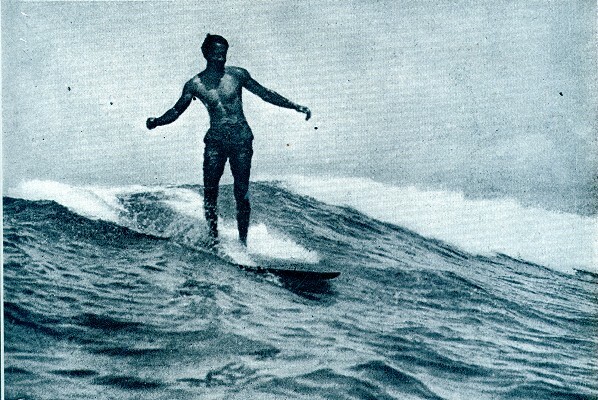 Among the noted surf-riders of Hawaii in the olden day was Kauikeaouli, who, on the 17th March, 1814, was born at Keauhou, 0n the big island which gives its name to the whole group. The young Prince, who afterwards became ruler of all the islands under the style of Kamehameha the Third, was from his early youth devoted to all manly sports, and it is recorded how he excelled all comers and delighted in challenging his friends to a trial of skill. To this day there may be seen the splendid remains of the most famous papaholua or sledge slide in the islands. This slide, which was most carefully built and is still bordered by a stone wall on either side, ran for a great distance up the mountain side, the lower end probably running clear down to the sea at the western end of the beautiful bay. It was paved with smooth blocks of lava and was kept covered with a slippery kind of grass which grew abundantly in the region. It was the custom of the Prince to repair with his friends to the summit and slide down on the narrow sledges which took great skill to balance, as far as the coral beach below. Here he had a summer house with a broad lanai, where he would don his main or loin-cloth and go far out to sea with his surf-board, upon which he would then shoot in to the beach, landing at his house on the shore. Cook, paid his ill-starred visit to the islands. the world, and an interesting account has been left by the historian of the expedition. At that time, and indeed today, the surf which breaks on the coast around the bay extended to a distance of about one hundred and ﬁfty yards from the shore, within which space the surges accumulating from the shallowness of the water were dashed against the shore, according to the historian, with “prodigious great violence." of color porters that are sent abroad to attract visitors. Twenty or thirty of the natives, taking each a narrow board rounded at the ends, would start out together from the shore, and upon meeting the first wave would plunge under it, allowing it to roll over them until they could rise again and make headway by swimming out into the sea. The second line of breakers would be encountered in the same manner, the great difﬁculty lying in seizing upon the proper moment for diving under it. being then required to prevent himself being dashed against the rocks and battered into a shapeless mass. But, the second difﬁculty safely over-come, the smooth water beyond the surf would be gained in safety, and then the swimmers would lay themselves full length on their boards and prepare for their swift return to shore. As the surf consists of a number of waves of which the third is invariably the largest and breaks higher on the beach, the rest breaking in the intermediate space, the ﬁrst object was to throw themselves on the crest of this largest surge, by which they would be driven with amazing rapidity towards the land. If by mistake they happened to choose one of the smaller waves and failed to keep their plank in the proper position on the top of the swell, they would be exposed to all the fury of the large wave following, and in order to avoid it would be compelled to dive and regain the starting point. Those who succeeded in their object, however, would have a still greater danger to encounter, for the coast being guarded with a chain of bristling, jagged rocks with only a very small opening here and there, they would be obliged to steer their board through one of these, or, in case of failure, to dive before they reached the rocks, and, plunging under the wave, to make the best of their way back again. In the olden days this was considered a great disgrace, and was also attended by the loss of the board, which was often dashed to pieces at the very moment the rider quitted it. The swimmers used often to pass nearly a mile seaward in order to enjoy the rapid motion of their return as long as possible. Both sexes and all ranks united in it, and as I have already said, even the chiefs and princes of highest rank were wont to mix with their humblest subjects in the life-giving sport. As corpulency was a thing greatly admired by the chiefs, and as they took great pains to attain it, the humble subjects must occasionally have been treated to the edifying spectacle of a greatly rotund over-lord suddenly awakening to the fact that he was headed on his surf-board direct for a jagged rock and immediately seeking refuge with a resounding splash and huge displacement of the water. One may well imagine the shout of laughter which must have greeted his ears as he made the dive and the innocent, serious faces and the silence with which his uprising would be met, for it was a serious matter in those days to incur the displeasure of a chief. 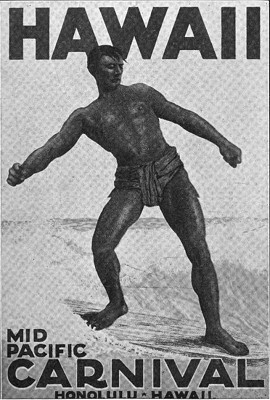 The surf-boards used were of varying sizes, according to the age and stature of the owner, and no better idea could be gained of the great physical development attained by the Hawaiians of old than by an inspection of some of the great surf-boards formerly belonging to famous chiefs, and which may now be seen in the Bishop Museum in Honolulu. polished and continually rubbed with coconut oil. Such wonderful mastery of the waves could only be obtained by familiarity with the waters from earliest childhood. picting the sport will show that the type of surf prevailing in Kealakekua Bay was very different from the gentle swell familiar to visitors to the famous beach of Waikiki near Honolulu. The Kona surf was indeed a thing requiring immense skill to negotiate in safety, and it is small wonder that the historian of Captain Cook’s expedition should have gazed upon the exhibition of surf-riding with much awe and genuine admiration. The island children were able to swim almost as soon as they could walk, and sometimes even sooner, their mothers taking them from the breast and laying them on the surface of the water, encouraging them to kick about as if lying on their mats ashore. There is a most amusing account by an early writer of a terrific meeting with an object which he took to be a truly gigantic frog, but which eventually turned out to be a very small baby lying on its back in the water and bravely disporting itself in a thoroughly contented manner. Visitors to Kealakekua Bay and to the monument erected to the memory of Captain Cook may perhaps be lucky enough to witness surf-riding under the ancient conditions, but the average sojourner in these delectable islands as a general rule is satisfied with the less exciting performance to be seen daily on the Honolulu beaches. That very considerable skill and much practice are necessary for the control of even a modern surf-board will be clearly demonstrated by the plucky though somewhat amusing efforts of beginners. Cleanly, healthy, muscle and eye-developing, surf-riding is a sport to appeal strongly to the tired business man in search of novelty and invigoration. crest of the long rollers. Sunshine, laughter, the beautiful surroundings of sea, mountain, and palm-fringed shores combine in no small measure with the sport itself to give health, strength, and la joir de vivre to all who participate in the ancient pastime of the Hawaiian people. 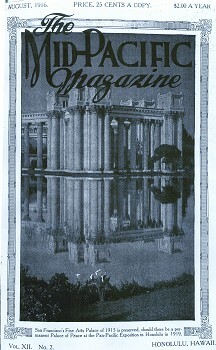 Volume 12, Number 2, August 1916. Geoff Cater (2016) : L.W. de Vis Norton : Sport of Princes, 1916.